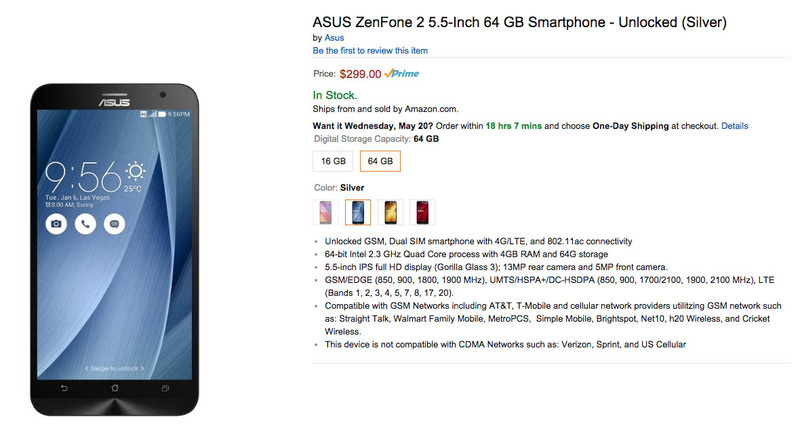 ASUS’ affordable yet premium smartphone, the ZenFone 2, is now available for purchase in the US through Amazon. It technically wasn’t supposed to go live for another couple of hours, but you won’t see us complaining about being able to order a phone with this price and these specs a bit early. As a quick reminder, ASUS announced US availability this morning, stating that the phone would be available beginning May 19 at retailers like Amazon, B&H Photo, and Newegg. The phone features a 5.5-inch HD display, 1.8GHz/2.3GHz 64-bit quad-core Intel processor, 13MP rear camera, 5MP front camera, 2GB/4GB RAM, 3000mAh battery, 16GB/64GB of storage, and connectivity on T-Mobile and AT&T. I listed dual-specs in some places because there are two models to be had here. You have the 2GB RAM version and the 4GB RAM version, with a $100 price difference between them. The 2GB version runs just $199, while the 4GB version is a pretty insanely low $299. With the 4GB/$299 model, you also get a special 18W BoostMaster adapter that can charge the phone quickly in a similar way to Qualcomm’s Quick Charge 2.0. The phone is an unbeatable price, especially for an unlocked phone with this list of specs. And you know how we love unlocked phones.